@JonathanLittle talks position, backdoor draws, and semi-bluffing in this tournament hand analysis. This week's hand comes from a six-handed no-limit hold'em tournament I played in New Jersey — I believe it was a $1,000 buy-in event (perhaps larger). It was early in the tournament, and with a stack of 20,000 and the blinds at 50/100, I was dealt on the button and opened for 300. It folded to the big blind where a very good, young player with a similar-sized stack three-bet to 1,050. As I discuss in the video below, this player was strong and balanced enough to make it very hard for me to narrow his range very much when he three-bets in a situation like this. In fact, as I look back on the situation I would probably rather have folded to the reraise rather than call as I did. The flop came , and my opponent bet 1,100 (about half the pot). With two overcards and the backdoor nut-flush draw, and with stacks as deep as they were, folding isn't really an option here, I think, so I called, making the pot about 4,300. The turn brought the and my opponent checked. With all my draws and my lack of showdown value, I knew I wanted to bet, but how much? Take a look at what I decided to do with my turn bet and also what happened after I did. As this hand shows, sometimes sticking around until your opponent shows weakness works out. 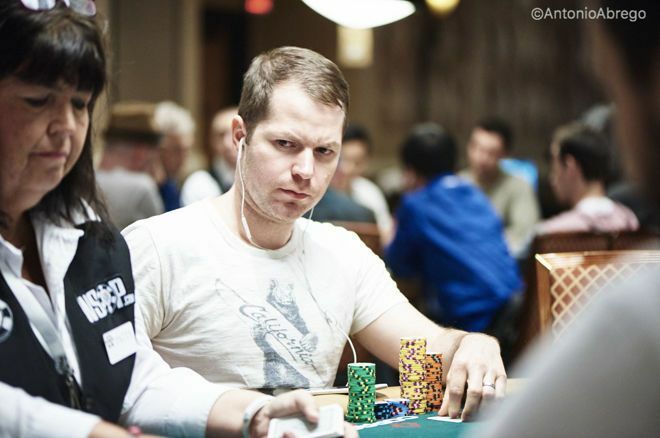 Jonathan Little is a professional poker player and author with over $6,700,000 in live tournament earnings. He writes a weekly educational blog and hosts a podcast at JonathanLittlePoker.com. You can follow him on Twitter @JonathanLittle. Android Slots: What Are The Best Free Slots Apps in 2018?